In Autumn Getaway, Book One of the Seasons of Love series, Lydia connected with charming, sensitive Sam, and took a chance on someone new. Then, in Winter Hopes, Book Two of the series, Sam and Lydia explored the excitement of their blossoming romance. Even though their long distance relationship wasn’t easy, in each other they found renewed hope, overcoming past losses to learn to trust and love again. In Spring Shadows, Book Three of the series, author Jennifer Gracen brings Lydia and Sam one step closer to lasting happiness. But then romance and roses turn to tears as unexpected tragedy threatens to tear them apart. 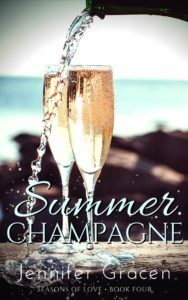 In Summer Champagne, the final book of the Seasons of Love series, Lydia and Sam face their challenges shoulder to shoulder, but the deep commitment they’ve worked so hard to build brings the fear of equally serious loss. 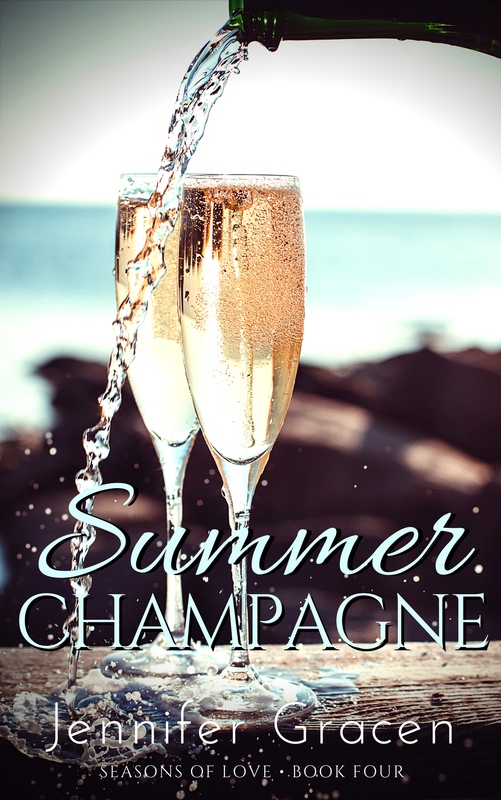 Summer Champagne takes the genuine emotions you’ve come to expect from the Seasons of Love and presses them up against the harsh reality of life in a genre-defining tale of love, healing, and hope for the future that will have you toasting the lovely couple with your own glass of champagne. Where to Find Jennifer Gracen!